Gardening time in one of my favorite times of year but it always leave my hands looking rather rough, brown, or even sometimes stained with green (that just means I’m doing it right, right?). After putting up with it for a few years I decided that a good homemade hand scrub to use when I came inside from gardening was a must. This recipe is incredibly simple and takes only a few minutes to put together, you will wonder why you haven’t made it already! 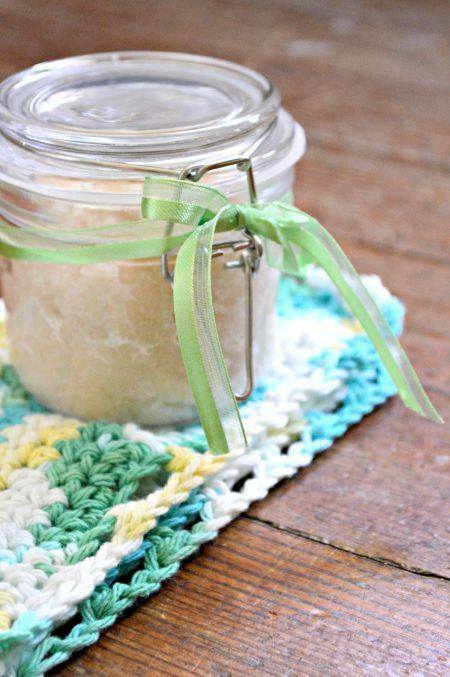 Making this scrub is very simple for something that is so effective! Simply use a small bowl and melt your coconut oil to a liquid. Add in the sugar, salt, and essential oil if desired. Stir all of the ingredients together until the mixture is fully combined. Place the scrub into a jar or another air tight container and store in a cool place until ready to use. To use the scrub, simply scoop out a small amount into your hands and scrub over dirty garden hands. Rinse with warm water and pat dry with a towel. If your hands feel greasy after use you can rinse them again with regular hand soap. Need a quick gift idea? Place this in a glass jar with a fabric square and you have a homemade gem anyone would love to receive! 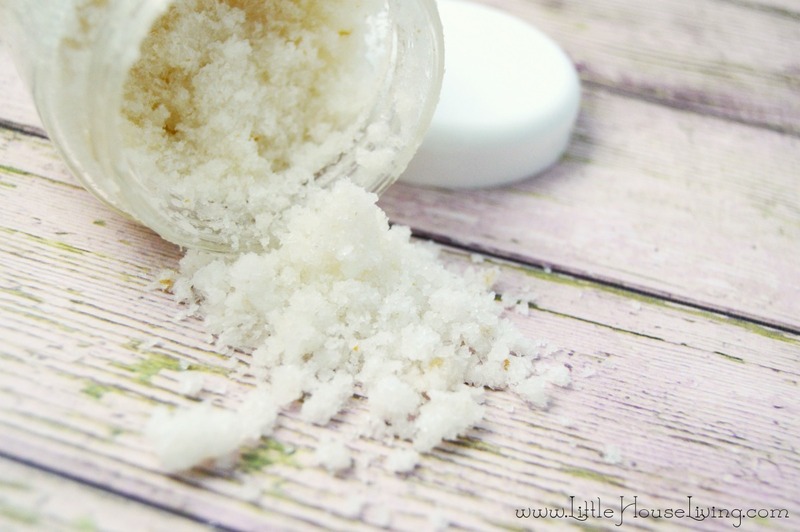 If you liked this recipe you might also enjoy our recipe for this Sea Salt Body Scrub. Or for something a bit more “fancy” you may want to try my Cinnamon Vanilla Bean Homemade Body Scrub. It smells so good! Check out all the other homemade gift ideas or DIY projects we have here on Little House Living, too! Want more fun recipes just like this one? 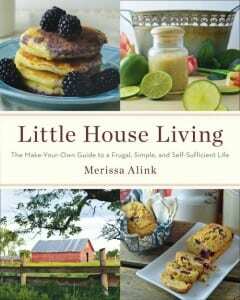 Make sure to check out my book, Little House Living: The Make Your Own Guide to a Simple, Frugal, and Self Sufficient Life. It has over 130 original recipes for everything from beauty to food products and I know you will love it! What is your favorite addition to a Homemade Hand Scrub? My skin gets SO dry in the wintertime- I’ve been using Plantain Oil and Aloe Vera on it, but this recipe sounds better since it will slough off the dead skin. I’m definitely going to make some of it! Definitely let us know how it works for you! Does the lemon sting at all? My hands are cracking something terrible and its quite painful! Not really. The zest is there for purely fragrance purposes, so you could omit that if you wanted! I made this for my sister who is a chef and her hands are always cracked from being in water all of the time. She LOVES this stuff! This sounds like it would make a good body scrub, too. Thanks! Yes it would! Just be careful from oil getting on the floor of the tub/shower. It can get quite slippery! Thankyou for this Post! I am definitely going to make this scrub! I am a Licensed Cosmetologist ( Hairstylist) for 20+ yrs. & have worked in some of the nicest Salon/Spa’s around! & since I’m now Stay @ home, I miss those sugar/salt Scrubs! They work wonders on all the Rough spots! Thankyou for the Recipe!! ;-). No problem!! Let us know how you like it! Can you use this as a daily lotion too? Also, I bought coconut oil but it’s not virgin and it doesn’t smell sweet. Does it really change the scrub or does it REALLY matter? Could I use kosher salt instead? Hi Dominque, Where can you buy virgin coconut oil? I would really like to try this. Can you use Kosher salt or does it have to be Sea salt? thanks for posting this. What is ratio of sugar to salt? I would love to know the ratio of sea salt to sugar as well. Hello, Merissa, I am thrilled. I just finished showing twenty women how to make this scrub along with how to make home-made coconut oil lotion. They are thrilled to learn about this. Our women’s fellowship group had a fun time together. Thank you so much. Sounds like a great get together, I’m glad you had fun! This is an excellent combination of ingredients. I love coconut oil! Definitely trying. Looks like a great scrub recipe. My mom does a ton of gardening in the summer – I need to make her some of this or tell her how to make her own. Thanks for sharing the recipe. Hi! Hopping here from Back to the Basics Tuesday. I’ll definitely be adding this recipe to my collection! Blessings to you and yours! Thanks for sharing. My hands get so dry in the winter that they bleed. Pinning this to try! Oh, this sounds wonderful! I can imagine a few different variations for scents. Pinning! and sharing with others. Such an easy recipe! Thank you for posting it. Is there a shelf life for this hand scrub and/or should it be refrigerated? My daughter is allergic to coconuts. I wonder what other kind of oil could be substituted that would still smell nice? You could use just about any other kind of oil in this recipe, jojoba, almond, avocado, ect. Now this is the kind of body care product that I love – edible, no weird, unpronounceable ingredients! Thanks for sharing! Thanks for sharing this – I’m going to put this on my Ideas for Gifts and pass it onto my kids as well (to make for me!!) As a barefoot family cracked and dry feet are always something we are aware of. This sounds great. I love homemade scrubs. I would be honored if you hopped over to share with us at Inspire Us Tuesdays. Such a great idea. I am going to try it out. Pinned and shared. easy and works well? Thanks for sharing this great hand scrub recipe. I think it will work great on my feeties too! This seems easy to do – love it! Thanks for sharing at Savoring Saturdays! OK, I’m definitely trying this one! It looks easy, and boy do my hands need it. Thank you! What a great tip! Hello, my name is Misty, from The LadyPrefers2Save, and I’m one of the new co-hosts for the Merry Monday Linky Party! Thanks for linking up at the Merry Monday’s Linky Party this week. Have an awesome week! What’s the ratio of solid (salt and sugar) to the liquid oil? I”m not sure what the final consistency should be. Thanks. You can add either salt or sugar in this recipe or even both depending on what you have. Both are in the directions because it doesn’t particularly matter for this recipe which one is used. I generally use a coarse sugar since that’s what I have on hand. I read some comments that said there was lemon zest in the recipe, but I don’t see it in the recipe above. Also, can you use a different oil besides tea tree, or is there an important reason for it? Thanks! We found that the lemon that was included in the original recipe could be irritating to the hands (especially if they are cracked). You could use a different oil besides tea tree….lavender in particular would be great! You can definitely sub almond oil, jojoba oil, or a similar oil in this recipe. For an oil that is always a liquid though you just might want to add a bit less. I would love for you to add this to my Recipes and Crafts Facebook Group. I love this! I have been into the body scrubs lately and have made chocolate and spearmint. Right! Why didn’t I think of this?! My recipe is similar, without the sea salt. Thanks for linking this awesome hand scrub up on Happiness is Homemade – we’re featuring it! I love this idea for gifts and I have a perfect person in mind too. She’ll love this one and the Cinnamon Vanilla one. I stained some furniture and had it all over my hands. I wasn’t sure how I was going to get my hands clean without harsh chemicals but I tried my hand scrub and it got my hands spotless!